The 18th Century proved to be a prodigious time for the establishment of hospitals in England. Many of the London teaching hospitals were founded at this time, followed by a rash of new hospitals in the provinces. Doctor Alured Clark, was appointed Dean of Exeter in 1741, having held the same post at Winchester, and having been instrumental in the founding of the Royal Hampshire Cottage Hospital in 1736. 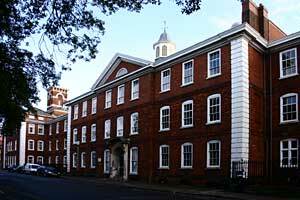 Soon after arriving in Exeter, he convened a meeting of interested and local gentlemen on 23rd July 1741, with a view to founding a similar hospital in Exeter. Offers of support soon came in, and John Tuckfield donated a large area of land in Southernhay, that had formerly been used as a tilt yard and a public space for fairs and horse shows. Thirty five days after the first meeting, the 'foundation stone was laid in a very solemn manner....and a party of soldiers saluted with three volleys of small arms'. While the new hospital was being constructed, the City Corporation opened the City Hospital as a rival. See Old City Hospital above. The architect for the new hospital was John Richards who was born in North Devon, and had no formal architectural training. His design, of what is now, the elegant Dean Clarke House was built in two stages. The central block and southern wing were completed first, while the northern wing was added to balance out the whole, some six years later. Alured Clark died some months before his creation was finished. On 1st January 1743 the first two patients, Mary Coote and John Elliott, were treated as outpatients and five days later the first four in-patients were admitted into the thirty bed hospital. 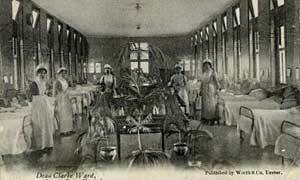 The first stage of the hospital had four wards - the Devon, the Exeter, the Bristol and the Winchester Wards. 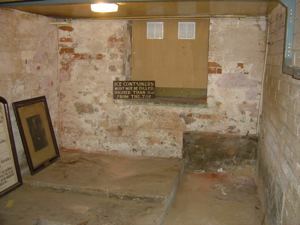 Interestingly, the beds were placed with their sides to the wall, foot to foot, under the windows. Later, they were placed with the foot of each bed against the wall, and it wasn't until 1821 that the head was placed in the conventional position, against the wall. Another feature, that could be reintroduced, for medicinal purposes only, was the brew-house which supplied three pints daily to each patient. Water was likely to be contaminated, so the supply of beer was usual in workhouses and hospitals, and would also supply the patient with much needed carbohydrates and vitamin B. The medical staff at the opening of the hospital consisted of six physicians, five surgeons and an apothecary. The apothecary was employed by the hospital at £30 per year, while the physicians and surgeons were honoury, running their own private practices elsewhere. In 1741, the nursing staff consisted of a matron and two nurses, which by 1752 had become eight nurses for fourteen wards. Night duties were performed by 'outside females', who would waken the ward nurse, who slept in a cubicle attached to the ward, if there were an emergency. In the 19th Century, many of the names of the medical staff would have been recognised by those who attended the hospital fifty years earlier. Sons and grandsons would follow into medical practice - James, Patch, Luscombe, Shapter, de la Garde, Harris and Roper were all families that provided surgeons and physicians to the hospital, for more than one generation. In 1855, the nurse training centre was created, when a Scottish woman was trained for nursing at Scutari Hospital in the Crimea. Rolle Ward was equipped in 1860, as the hospitals first children's ward, funded by Sir John Bowring, after whom the ward was named. Towards the end of the century, in 1891, a Nursing Committee was set up which implemented a system of Ward Sisters, Charge Nurses and probationer nurses. The first X-Ray taken for medical purposes was in 1898, and the treatment of cancer with radium commenced in 1925. It was Dr Miller Muir who pioneered the use of X-Rays in Devon for the treatment of TB and cancer. After the Duke and Duchess of York visited the hospital in 1899, the hospital was given permission to add Royal to its title, becoming the Royal Devon and Exeter Hospital. Many medical improvements were introduced in the early 20th Century, especially radiography (x-rays) and improved anaesthesia. It wasn't until 1928 that the first Maternity Department was partly completed. In 1927 the Royal Devon and Exeter Hospital ran its first Motor Week, to raise funds for the casualty wards that treated the injured. In 1932 motorists and cyclists were invited to purchase a windscreen badge for 2/6 and 5 shillings, and also donate a sum, to help fund the work. In 1928 they raised £1,020 and in 1930 £1,405. The Royal Devon and Exeter Hospital escaped damage in the Exeter blitz and on 24th August 1948 the last board meeting was held before the hospital became part of the newly formed NHS. By the 1960s, buildings of the RD&E were becoming inadequate for a modern health service and in 1974, the hospital moved to a new, purpose built, facility on the former Heavitree cricket field at Wonford. The site was dominated by a large concrete and glass block, containing many of the wards - the view from Tor, the cardiac ward at the top, over the city, was extensive. Renal dialysis was first given in 1964 to a patient by Harry Hall, before a dialysis unit was established at Whipton Hospital. 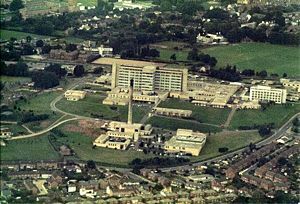 By 1978, the hospital had a purpose built, eight bay kidney dialysis unit at Sid Ward, treating seventy patients with dialysis or after a transplant. Now the department treats 400 patients across Devon with specialist dialysis units at Torquay, Honiton, South Molton, Taunton and Heavitree. Unfortunately in 1985, the 400 bed building was found to be the first major structure in the country to suffer from concrete cancer, caused by a chemical reaction making the concrete expand, and push out the surface layers, which then fall off. It is thought that condensation from the kitchens would have been sufficient to cause the reaction. Plans were drawn up to build a new, low level hospital and demolish the previous structure, at a cost of £40 million. 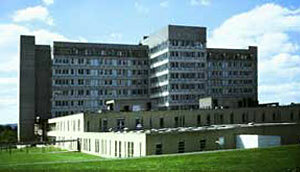 The first section, including a new eye infirmary, opened in 1992, followed by phase 2 in 1996. The old hospital had to be demolished on a tight site without causing contamination to the surrounding buildings, and a large amount of asbestos carefully removed, before a car park and landscaping were installed on the vacant ground. The hospital opened the Peninsula Medical School on 1 August 2000, after being given a grant by the Government. The bid was led by Professor Sir John Tooke, who became the first Dean. By 2004, the new building for the Peninsula Medical School was complete. In 2012, the school was split between Plymouth and Exeter, with the University of Exeter Medical School being attached to the hospital. On 15th June 2007, the new maternity, neonatal and gynaecology unit opened at Wonford. The facility cost £31.5 m and covers 9,000 sq metres, has 150,000 metres of cable, 3,550 terracotta tiles, a water-birthing pool, 453 doors and 237 rooms, of which, 10 are delivery rooms. The first baby born at the unit was Leila Burnett who was delivered to her mother, Amy Burnett at 1.30pm on the 15th June 2007. Her parents were on holiday in Dawlish when little Leila decided that she would set a trend for life and arrive early, so she could take a look at the new unit. 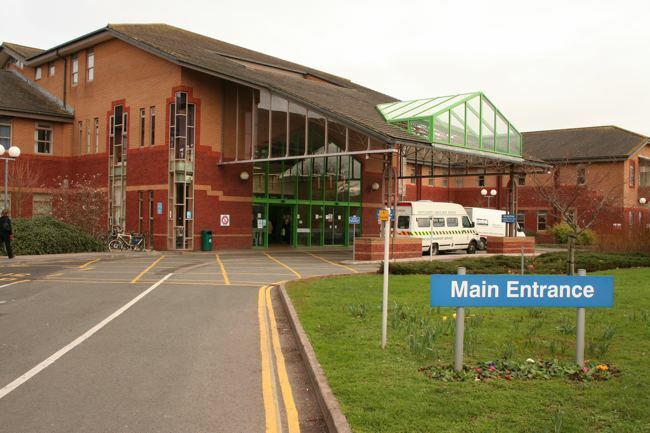 Sources: 1 Stone Unturned - Christopher Gardner Thorpe - the bulk of the text was sourced from A History of the Exeter Hospitals - 1170 to 1948 by P M G Russell, the Express and Echo and the hospital's own Foundation Magazine. Dean Clarke House, the old Royal Devon and Exeter Hospital. Dean Clarke Ward at the old Royal Devon and Exeter Hospital, pre First World War The ice room in the basement. 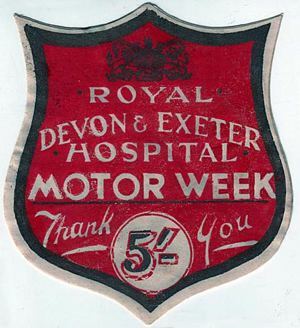 The badge for the 1932 Motor Week - a badge could be purchased for 5 shillings, with the proceeds going towards treating patients injured in motor accidents. 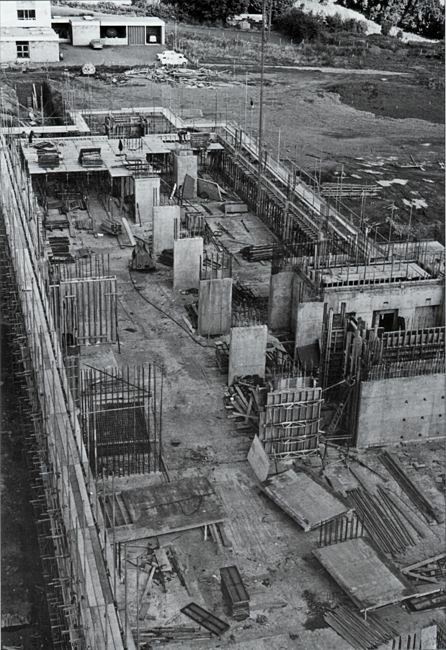 The foundations of the new hospital in 1969. The old RD&E that was demolished due to concrete cancer. The photo is with the kind permission of the Royal Devon and Exeter Foundation NHS Trust. The Royal Devon and Exeter Hospital from the air. Photo courtesy of Andre Thorpe. The entrance to the Royal Devon and Exeter Hospital, Wonford.